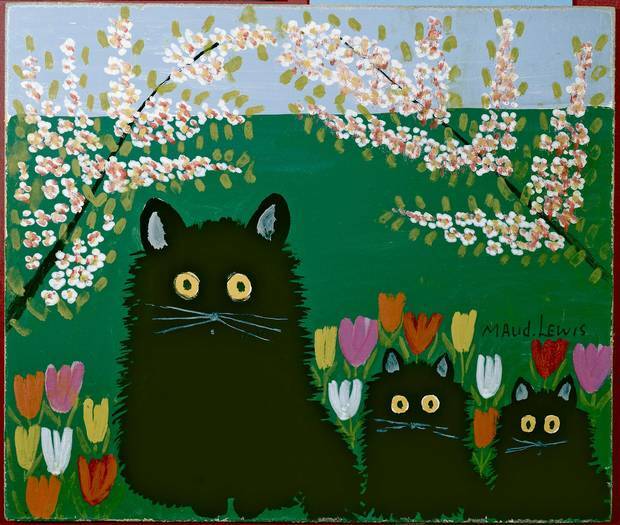 Maud Lewis (1903 - 1970) was the first Canadian folk artist to achieve any sort of national, and even international, fame. From her tiny house alongside a rural highway in Digby County, N.S., Lewis spent more than 30 years painting and selling her brightly coloured and joyful work, which, despite her limited physical abilities (she was disabled by juvenile arthritis, her hands so gnarled she had difficulty holding a paintbrush), has become one of the most recognizable bodies of work in Canadian art history. Her paintings, which during her lifetime rarely sold for more than $5, have reached five-figure amounts in recent Canadian auctions and her work has been exhibited extensively across Canada. Maud and her husband, Everett, lived in a tiny house that had been a storage barn before its conversion to a home. Because it lacked the most basic of amenities, such as electricity and running water, Lewis decorated the interior and exterior of the house to make it more attractive – painting the shutters, the doors, and the walls. The house became as much an advertisement for her painting business as her hand-painted signs along the side of the road. Confined to the lower level of the house by her physical challenges, Lewis made the single room her studio, her showroom and her "canvas." Generations of Nova Scotians and visitors to the province driving by Lewis's tiny house would stop and buy paintings as souvenirs, ensuring that Lewis's work spread across North America, even hanging in the Nixon White House. After Lewis's death (in 1970), and Everett's (in 1979), the "Painted House" deteriorated. It was purchased by the Province of Nova Scotia in 1984 and underwent significant restoration under the supervision of the Art Gallery of Nova Scotia. In 1998 it was unveiled at the AGNS in Halifax, where it is on view today. Lewis's paintings often depicted carriages, sleighs and other horse-drawn wagons. While these were still common in her youth, by the time she was painting, the images of carriages were nostalgic evocations of times past (Everett, however, still used a horse drawn-wagon to sell his fish). Many of her images were actually based on Christmas cards, images she adapted to reflect the local scenery of Digby County. This image of a family on a country road is typical of her work, as is the exuberant seasonal colour – a tree in autumn foliage with blooming tulips in the foreground. Lewis painted from memory and her imagination, as well as from found images that she adapted to her own style. It is common to see compositions in her paintings that were borrowed from cards, prints and images from magazines and calendars. She also repeated her images when she had found one that was particularly popular. She painted to live after all, her small income was often the only cash income she saw. One of her most loved images is of this black mother cat with two kittens, an image she returned to many times over the years. Lewis's work is nostalgic, depicting an early Nova Scotia that appealed to her clients, most of whom were vacationers. The Bluenose, the schooner that graces the Canadian dime, is a Nova Scotian icon, a replica of which, the Bluenose II, was constructed in 1963 by Oland Brewery as a promotion for its Schooner beer brand. It now serves as "Nova Scotia's Sailing Ambassador." This image probably dates from the mid-1960s when the Bluenose II was much in the news, and while not a recurring theme for Lewis, it is an important painting in her body of work, an icon painting an icon. Well into the early 1960s farmers in parts of rural Nova Scotia still used yoked oxen to plow their fields. Images of ox teams in the spring, with apple trees in full bloom, were popular characterizations of Nova Scotia in print and art. Maud Lewis puts her unique spin on the subject with her frontal depiction and long eyelashes on the oxen. This team is pictured in spring, with tulips (another signature theme of Lewis) and blooming apple trees. This is another of Lewis's favourite compositions, and she painted oxen in every season of the year.